The Axe Bat Company heads into 2018 with a line of USA bats aimed to enhance the batting experience for all USA Baseball leagues especially upon the grip with some new handle innovations. The all-new Axe Element bat is a single piece aluminum construction that features Axe’s Mantic Alloy encased within the 2 5/8 big barrel. This metal offers military grade strength for optimum pop, loud pings, and ultra-durability. The barrel of the bat also features a new design to enlarge the sweet spot region and expand the potential for solid collisions over a 270-degree area. As a means to differentiate themselves from other bat manufacturers, Axe developed the ergonomically crafted composite handle for all their bats allowing for unmatched comfort, control, and vibration protection. The composite handle is comprised of their Endogrid technology which sustains and lowers shock vibration creating a smooth and comfortable feel. The top of the 2 5/8 barrel comes with their HyperWhip end cap that simultaneously decreases swing weight while increasing swing speeds also extending the length of the barrel. Lastly, it features an end loaded swing weight design placing extra mass within the sweet spot of the barrel making it a youth baseball bat for older and more skilled players. The Axe Bat Company has developed a reputation for designing the most ergonomically efficient and supremely comfortable handles in the youth baseball bat industry. 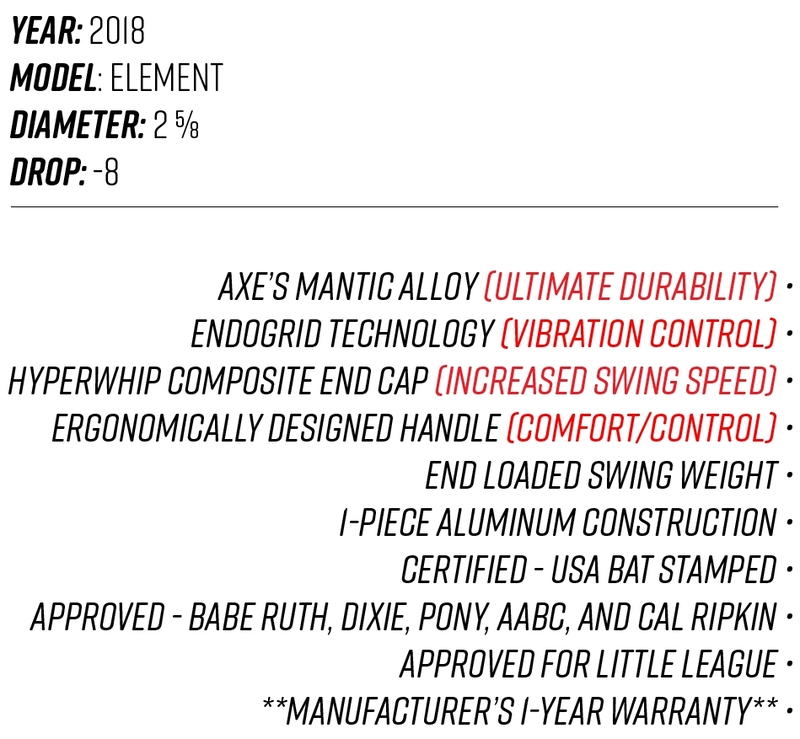 The Element -8 drop is the company’s best answer to the question… “How much will the USA Bat standard affect my child’s swing?” In our experiences within the youth baseball community, it’s easy to see that the Axe Bat Company has a strong following. While brands like Easton and Rawlings may have more mainstream exposure, these bats are among the most underrated youth bats especially in regards to design, quality, and durability. To correlate the unique following of Axe bat users, about 80% of our volunteers who requested to use the Element or the Elite stated they preferred Axe youth bats in previous season or they have used Axe bats before. After approximately 250 solid swings, below is our official review of the 2018 Axe Element -8 Drop USA youth bat. When analyzing how it fought off shock vibration, we based our score directly from the our volunteer's scorecards. Less than 10% of our youth hitters reported feeling a consistent sting upon their grip. Again, these statistics are very good especially considering it encompasses a single piece, alloy construction. What can we say, Axe's special ergonomic handle deflected the stings. Axe Bat Company prides itself with designing and manufacturing highly innovative handles on their metal barrels. One of our volunteers noted on his scorecard, “The grip and feel of Axe bats are what made me like them two seasons ago. The Element has a great grip and it feels very comfortable to swing. Very balanced also.” For our staff’s perspective, we witnessed every hitter that stepped in the batter’s box with the Element quickly adjusted to the aspects of a USA bat. This youth bat offers comfort and confidence over many other USA Bats bearing a single alloy construction. Our staff gave good scores to it with regards to durability. Even after 250+ swings, our staff could only find typical scratches and handling marks on the barrel. Every Element we tested held up against dents and cracks. The strength of the military grade alloy withstood all the punishment our volunteers had to offer. Overall, the 2018 Axe Element provided our youth hitters with the same traditional comfort and feel as the older generation Axe bats. It delivered our hitters a great blend of pop and balance. If your youth player is accustomed to Axe bats, now is not the year to make a change. Despite the -8 drop label, we believe it is one of the lightest -8 drops of all the USA bats. Ours we tested came in about an ounce lighter. The Axe Bat Company continues to be one of the most under valued youth bats in the industry.